Devasthanas/ Dharmasthanas/ temples have been large players in the eco system of our society, be it environmental, financial, material, educational, health or cultural. Gudiya Sambhrama is a step towards rejuvenating and reviving this temple eco-system and is brought to you by Heritage Parampara. Heritage & Heritage Parampara are not-for-profit organizations that conduct annual festivals with an understanding of the deep connect our society has to both its cultural and natural heritage. Sacred spaces, Performing Arts and Mother Nature are the lifeline and heritage of society yet rarely celebrated in this fast pace of life today. The festival brings artists and scholars of repute from across India to heritage temples to share their knowledge and performances of Hari Katha, dance, music, theatre, puppetry, fabulous legends and more creating health and well-being, touching the lives of a cross section of society. The theme of this year’s festival is Sacred Sound – “Naada Brahma”. 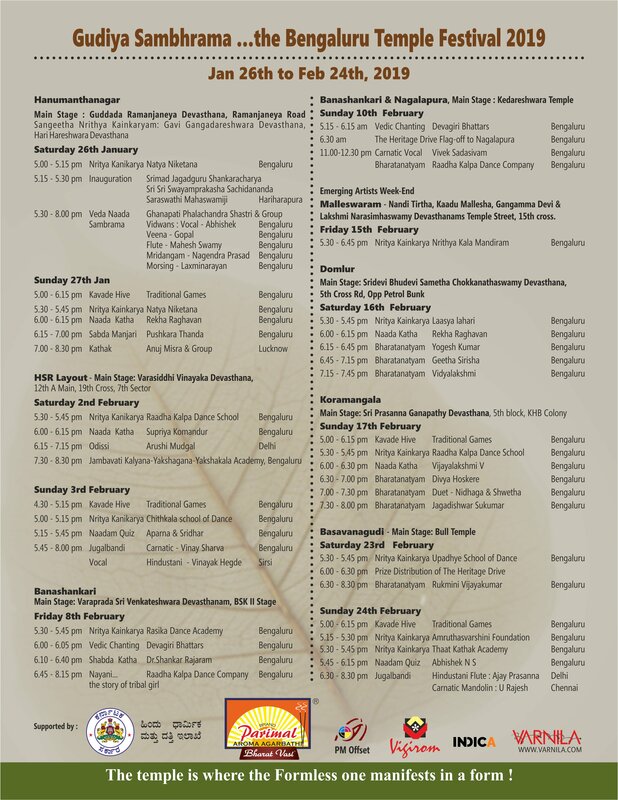 Besides the usual poster display related to the theme of the year, to celebrate the successful completion of 9 years of the festival, there will be special display of “the plants connected to the Navagraha’s”, and posters on Navarasas, Navadhanyas, Navaratnas & the special significance of the number ‘9’ in our culture. Gudiya Sambhrama, the temple festival 2019 comes to you with an added feature “The Heritage Drive” on the 10th of February. This is a TSD format motor rally of 250 kms to Nagalapura Kedareshwara Temple. The rally will be flagged off from Sri Devagiri Devasthanamamidst Vedic chants and will proceed to the 1200 year old Temple near Aralguppe where there will be a classical music and dance performance and trees will be planted as well.